Book plate image, Pg86, The US Register & Studbook for Cats (1906), courtesy of The Harrison Weir Collection. The influence of this single Silver male, upon the breeding of the Chinchilla, the Shaded Silver and other Silver varieties is nothing short of extraordinary, and incalculable. 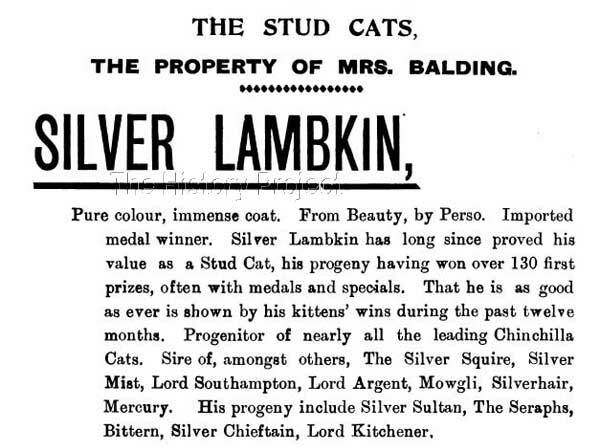 He is almost reverently referred to as the "Father of the Chinchilla Breed", chiefly because he was the first and most pre-potent contributing male, to the establishment of the Silver strain. And from his numerous and valuable sons and daughters, multiple dynastic lines were established, with slightly differing permutations, with an extremely liberal amount of in-breeding and line-breeding! So widespread was his own fame , and that of his many offspring, during his own lifetime, that when he died at the ripe old age of approximately 17 plus years in 1906, news of his demise was reported in newspapers around the globe! From The National Cat Club Volume V of the Stud Book (1896-1899), compiled by Miss Champion, p42. Courtesy of The CFA Foundation, Inc.
1. Photos and quotations as per sources quoted.